My payment was delayed for more than 15 days and when I queried for the payment they told to get the refund; and I too sent a mail regarding my refund but I got the mail shown below. discovered that you have already withdrawn more than you have paid in.
! ! ! Please do not join Adflasher ! ! ! Is this a business ? As per the FAQ mentioned in their site, my payments will be settled within 7 days. But, they are not pretty good in maintaining the initial success they had. 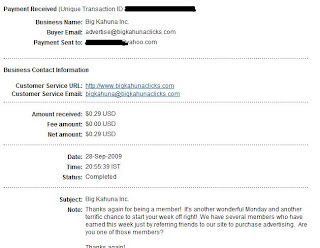 I have received my 4th payout in bigkahunaclicks. The payout is less $0.04 but with signup programs in the site we can able to get $0.10 for each. Here I am posting my payment proof received yesterday. These may be a little amount but these sites are really paying and are trust worthy. If you are really interested to earn some few cents at your free time, it is a nice opportunity. Just click the banner and register and start earning. I need to tell you about this site. The payout is low but will get an assured payment every four days is you are active. Getting more referrals earns more here. It is somewhat similar to bigkahunaclicks but only a 5 sec timer to view ads. You will be re-directed to a website where you can register. I have pasted my payment proof here. Just see if you are interested. Will see you soon with more updates. 5 comments to "Good and Bad things today in PTC"
You have got very good PTC sites. It looks as if they are paying you well. Your record of payments should convince other bloggers to join in. By the way, you got a very nice theme. Thnaks for your comments. I only put sites that are paying and trsuted which I get payment too. I use adflasher ...i am doing also now..now your post i read and i confused...and i finally reject to do this..thnx for the post...helpful to others ! !